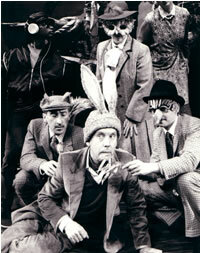 Commissioned by the Farnham Repertory Company, the play was first performed at the Redgrave Theatre, Farnham in 1986. The following year the play was presented on tour and at Sadler’s Wells Theatre, London, by Whirligig Theatre. There have been many amateur productions and a very successful Japanese tour. 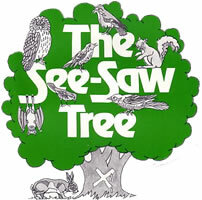 THE SEE-SAW TREE looks at an important environmental issue in an entertaining but thought-provoking way. The See-Saw Tree, an ancient oak, stands on ground which is ear-marked for development into a children’s playground by Mr. Jay, owner of the nearby supermarket. A public meeting is called in the village hall to discuss his proposals, which include cutting down the three-hundred-year-old oak tree. 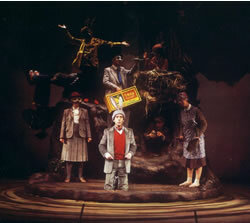 The audience vote in favour, but Mr. Bunn, an environmental activist protests and shows us the devastating effect such plans will have on the inhabitants of the tree – the main part of the play tells the story of these creatures (who can be played by their human equivalents), their panic and their resilience and their evacuation from the tree. In the end, the audience is asked to vote whether the See-Saw Tree should be saved or not. David Wood writes : At the beginning of the play, the audience becomes a public meeting to discuss the future of the patch of waste ground on which the See-Saw Tree stands. Because the idea is to transform it into a children’s playground, the audience vote for the development. It was always rather moving to witness how, by the end of the play, the audience completely changed its mind, having seen the effect that the cutting down of the tree would have on the creatures that live on it, and reversed the earlier decision. 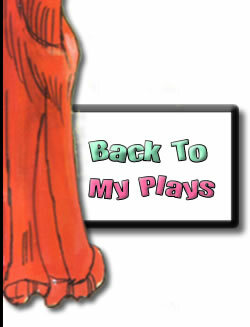 I wrote several different endings for the play, but at every performance the tree was saved! The play is constructed in such a way that the human characters play their human equivalents. There are eight in the cast. But this doubling is not essential, so a larger cast is possible. The play was first published by Amber Lane Press The acting edition, play and piano/vocal score are published by Samuel French Ltd. First Class Professional & Foreign Rights : Casarotto Ramsay Ltd. UK Repertory Rights : Casarotto Ramsay Ltd. UK Amateur Rights : Samuel French Ltd. US Stock & Amateur Rights : Samuel French Inc. The play is included in David Wood : Plays One (Methuen) US Stock and Amateur Rights : Samuel French Inc.